Acer announced it will launch its "world's thinnest" Ultrabook, the Aspire S5, late this month for $1,399. Measuring 11.2mm at its thinnest point, 15mm at its thickest, Acer is sticking by its "world's thinnest ultrabook" claim. It has weight to match, coming in at 2.65 lbs. The 13.3-inch ultrabook features an Ivy Bridge i7 processor and 256GB solid state drive. It's also equipped with USB 3.0, HDMI, and Thunderbolt ports, which are hidden by the MagicFlip I/O port panel that pops out of the notebook's back with the press of a button. The Aspire S5 will also be the U.S. debut for AcerCloud, a free cloud backup utility for images, media, and documents. AcerCloud can also be accessed on Android devices with a free app, making it easier to still access your data on a tablet or smartphone. 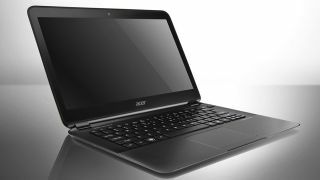 Acer will also upgrade its older Aspire S3 ultrabook to include Ivy Bridge i7 processors and a 256GB solid state drive. The storage boost isn't significant from the original model's 240GB SSD, but the Ivy Bridge chip should hopefully help with the notebook's disappointingly short battery life. The Aspire S3 will also offer a new color, champagne, with new models priced between $648 to $999 when they go on sale starting next week. However, if you want to hold out for the you'll have to wait a little longer before getting your hands on an Acer Aspire S5 though - but not too long.